The 69th Annual Scientific Meeting of the American Academy of Forensic Sciences in New Orleans, LA, proved to be a success. First, thank you to all contributors and participants. The annual meeting could not exist without you. Without the hard work of Pathology/Biology Section officers, workshop chairs, session moderators, program committee, and countless volunteers, this meeting would not have been possible. Thank you to those who presented their work in the Pathology/Biology Program, which included well-attended joint sessions with Toxicology as well as Anthropology and General. Overall, the Pathology/Biology Section contributed 155 presentations to the annual meeting. Of special note is the convincing Academy Cup win by our section! 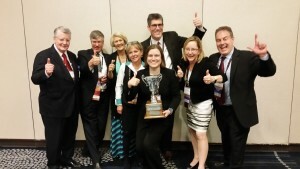 The Academy Cup team included Patricia McFeeley, Tracey Corey, Michelle Stauffenberg, David Carter, Andy Baker, Victor Weedn, Ed Donoghue, Amber Lukefahr, Joyce deJong, and Jim Caruso. The Academy Cup is a fun experience and we encourage you to participate in the future. All are welcome! The 2017 – 2018 Section Officers and Program Chair include: Section Chair, Joyce L. DeJong – Joyce.deJong@med.wmich.edu; Section Secretary, David O. Carter – david.carter@chaminade.edu; and Section Program Chair, Christopher Milroy – cmilroy@toh.ca. We were fortunate to celebrate the accomplishments of the following Pathology/Biology Award recipients: Gail Anderson (Award for Achievement in the Forensic Life Sciences) presented by Sherah Van Laerhoven; Tiffany Baker (Best Resident Paper Award) presented by Jim Caruso; Kim Collins (Milton Helpern Award) presented by Randy Hanzlick; and Victor Weedn (Milton Helpern Award) presented by Kurt Nolte. Sincere congratulations on your successes! Mark your calendars! Preparations have already begun for the 70th Annual Scientific Meeting in Seattle, WA, February 19-24, 2018. The theme for the annual meeting is “Science Matters,” with Research, Diversity, and Communication representing AAFS President Betty Layne DesPortes’ three core areas of focus. We expect another exciting program with a variety of workshops, scientific sessions, breakfasts, luncheons, and our joint session with the Toxicology Section. Please start thinking about workshop proposals, abstract topics, and nominations for the section awards. The 2018 Call For Papers form is posted on the AAFS website. As always, the submission deadline is August 1. Moderators and volunteers are essential for a successful meeting; such service is especially useful for those members wishing to promote. Please contact Chris Milroy if interested in this volunteer opportunity. If you are interested in promotion, please note that October 1, 2017, is the application deadline. Consult the AAFS website for general and section-specific requirements.